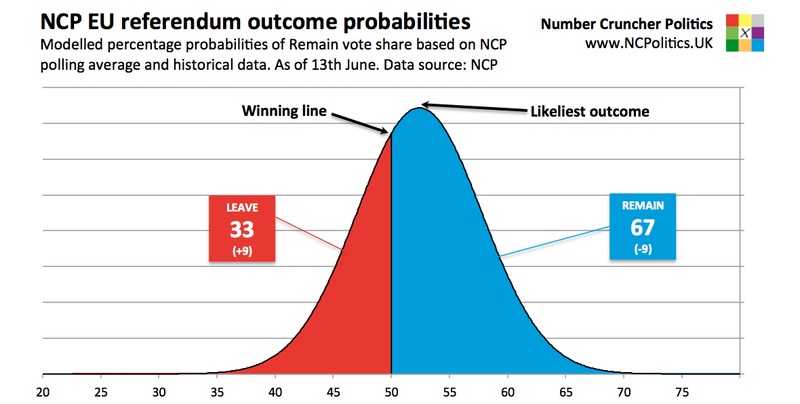 Brexit probability has risen sharply, with the NCP Brexit probability index now at 33%. Thus the chances of Britain voting to Leave the EU are higher than at any time since last year’s general election result confirmed that the referendum would take place. What’s happened? Well, before today the data flow was a string of online polls saying what online polls have been saying all along, together with limited evidence (one ICM phone poll over the long weekend) of relative movement in phone polls. At the time a bank holiday outlier seemed likelier than the phone online gap – that’s been present for years – suddenly vanishing altogether. But sometimes, less likely things happen, and so it may have proved here. I say “may” because we haven’t heard recently from the other two experienced phone pollsters, Ipsos MORI (expected in the Evening Standard on Tuesday or Wednesday) and ComRes, who will have at least one more poll before next the 23rd of June. ORB’s phone poll still showed a 5 point Remain lead, compared to a 10 point Leave lead in its online poll, but I would put more weight on ICM. In other words, the facts have changed, so I’ve changed my mind. Some will say that the facts had already changed and this move is the model playing catchup. The problem with that view is that simply taking the last n polls (as many polls-of-polls do) and ignoring the persistent modal difference is that you tend to get an awful lot of artificial volatility. Simple averages have moved around so much – in both directions – that whenever the real move eventually happened, the simple averages were almost bound to call it first. The problem is that they’d previously “called” several moves that never actually materialized. 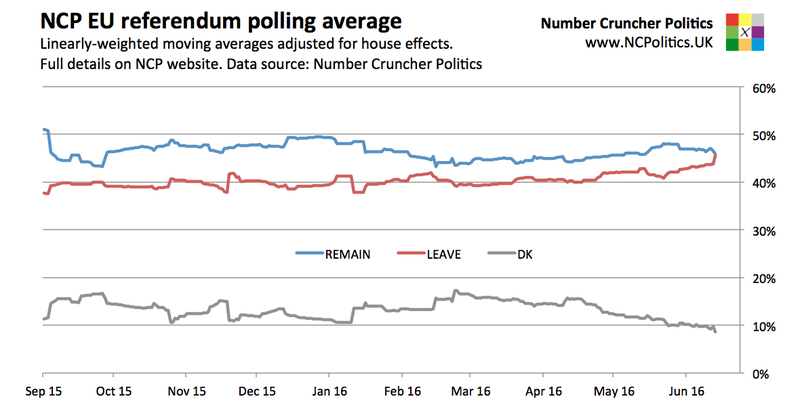 The difference now is that we have ample evidence that the move is real, despite the uncertainty about its size, and since it’s coincided with the phone-online gap closing, that adds up to big increase in the chances of Brexit. Moves of this size aren’t ideal in forecasts, but inevitible given the paucity of one mode of poll so late in the campaign. Further volatility is to be expected going forward – if ComRes and Ipsos MORI suggest that a significant phone-online gap remains, the outcome will be very different than if they too suggest it has disappeared. I said on TV a few months ago that for pollsters and forecasters, this referendum would be the biggest challenge of their careers. On that, my mind has not changed.